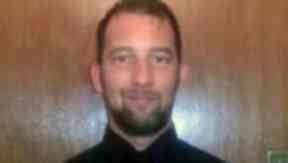 James MacDonald, 36, was last seen on Bonnington Road Lane in early hours of Saturday. James MacDonald: Missing man last seen at flat in Edinburgh. Concerns are growing for a man reported missing after he disappeared from a flat in Edinburgh at the weekend. James MacDonald, 36, was last seen at the property on Bonnington Road Lane in the early hours of Saturday and was later reported missing by family. Police have now launched a search amid concerns for his well-being. Mr MacDonald is described as white, 5ft 6in, of slim build, with medium-length dark hair and a short trimmed beard. He was wearing a blue Henley jacket with a high collar, blue jeans, hiking trainers and a blue rucksack and usually wears large headphones. He has links to Glenrothes in Fife and may have intended to travel there. A statement from Police Scotland said: "James has not been in contact with his family or friends since and there is growing concern for his welfare. "Anyone who may have seen James since this time, or has information which may be able to help, is asked to get in touch. "If James see's this appeal, he is urged to contact either us or his family and let us know that he is alright. Anyone with information can contact sergeant George Nisbet at Leith Police Station via 101."